I remember being a little girl and being slightly opposed to my mom buying beer for the strawberries in our garden. [Apparently it scares away slugs or something]. Since then, I have always been intrigued to know the secrets of botany, specifically pertaining to a family garden. Nate and I are renting the house we are living in at the moment, so having a full garden wasn’t an option. When, at church, they announced the ‘community garden’, I was excited for the opportunity to learn from the pros. Since then, I’ve been obsessed. The county donated this vacant lot of land to the two women who headed up this project. We began with about 11 families, but currently we have five. 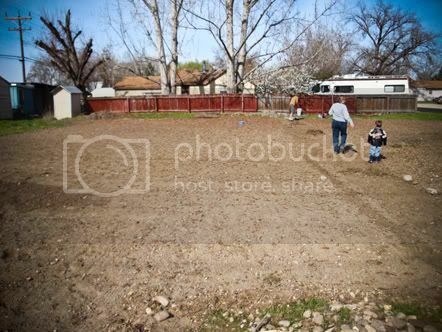 Each family is to work in the garden approx. 4 hours a week. We water three times a week, and we are each assigned a day. 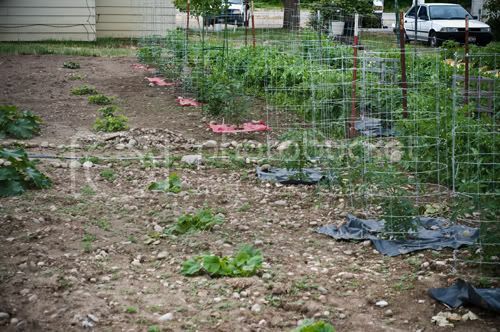 We have planted SO much that dividing up the produce fairly and evenly has not been an issue. … and corn!!! We have a cherry tree on the property as an added bonus!! We planted everything from seed besides the peppers and the tomatoes. Those particular plants are too sensitive to the cold, so it would have been too late to plant them when the weather finally warmed up. Not only have I learned about planting, I’ve been learning about how to use all the produce we grow. My first lesson in canning was with pickled beets. We will be canning A LOT and I’ve been collecting jars from garage sales since March. We’ll can sour kraut, LOTS of pickles, tomato sauce, soup and salsa. I’ve been learning how to make zuchinni muffins, brownies, bread, and cookies. I’ve cooked stir fries using peppers, radishes and peas. I’ve made a super easy, fast casserole with chicken, cheese and broccoli. I’ve made ‘Corned Beef and Cabbage’ with potatoes, carrots and cabbage. ... AND Italian]. Using my mom’s famous spaghetti sauce recipe, I used onions from the garden. I think the favorite thing that I’ve made would be a salad with cucumbers, beets, feta cheese and a light dressing I made with limes, soy sauce, and fresh basil and oregano from my herb garden. I use the same dressing on a steak and potato salad I make using potatoes from the garden [featured above]. It feels so good to be able to eat organic produce for so cheap. Monetarily, I’ve only had to contribute $20 to pitch in for some straw and the starter tomatoes. I LOVE eating the ‘fruits of my labor.’ Nothing is so satisfying, especially after tasting that first vine-ripened tomato of the season. Tomatoes HATE wind and they don’t have high light requirements because they are tropical plants. Marigolds and chives are natural bug repellants… especially to aphids. Plant them around the border of your garden or sporadically in your patch. Plant garlic in the fall and you’ll have a spring harvest. They are a cold hearty plant. Rabbit manure is the best fertilizer overall, but turkey manure makes the best strawberries. 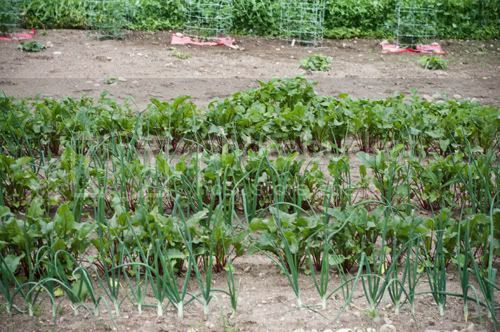 Onions and cucumbers require A LOT of water. If cucumbers don’t get enough water, they’ll be bitter. Hill [pile large mounds of dirt] around your potato plants to get twice as many. Belinda - Luisa, I am so proud of you! You are following in your grandfather's steps as well as your mom and dads. Grampy had a share in a community garden when we lived in Amesbury as well. As you know he was an avid gardener. I have been wanting to have a garden for a while, but I haven't had anyone standing there teaching me like you have. What a great opportunity that was for you. Now you can do as the Prophets have counseled and grow your own food. I love you so much. It was great to see you and Nate as we were passing through Boise on July 26th. I was impressed with the life you and Nate have made for yourselves. You are a beautiful couple! Keep it up! Learn as much as you can. Who knows when the little ones will come and then you will be very busy. Ken and Jen Perkes - P.S. I LOVED the garden tour! I heard it mixed with "Dream Big." It was the perfect background music! Ken and Jen Perkes - These last three posts say it all: LUISA YOU ARE A WONDER WOMAN!!! You ambitious lady!!! I love your garden; it's beautiful. Save a tomato for us in September!!! . . . or sneak one on the plane in August . . .
© 2019 Nate & Luisa|ProPhoto Photo Website by NetRivet, Inc.